CENTRAL FALLS, RI – The Central Falls Parks and Recreation and Police Department held their Summer Food Service Program kick-off event at Jenks Park on Wednesday, June 27. The program is free for kids in Central Falls and aims to promote the values and benefits of healthy living by providing nutritious meal options and enrichment through activities, games, sports and field trips. 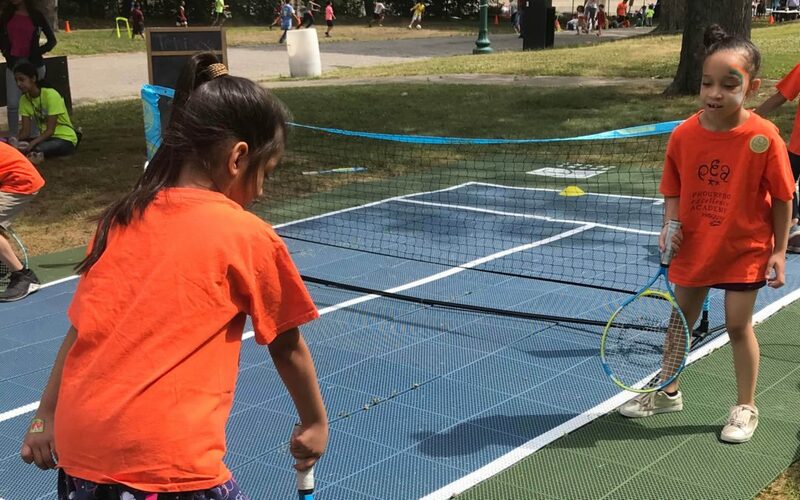 As part USTA New England’s ongoing Hispanic engagement efforts in Central Falls, the organization partnered with the Parks and Recreation and Police Departments, and as a result, tennis programming will be offered twice a week at the Summer Food Service Program. “I think its going to be a great opportunity for youth in the community to learn to play tennis and it will be a great tie in for the tennis courts that we will be constructing in the fall at Sacred Heart Park,” said Rob Sayre-McCord, Director of Parks and Recreation and Community Service. At the kick-off, more than 150 kids visited USTANE’s pop-up court where they were able to practice tennis, go through obstacle courses, and receive a Net Generation ball and bag for participating. Mayor James Diossa and Chief of Police, Colonel Mendonca, joined the kids on court and faced off in a match of their own. In addition to tennis, kids also enjoyed activities such as bounce houses, face paint, balloon animals, train rides, a dunk tank and other sports. The Central Falls Summer Food Service Program runs Monday – Friday until August 25. For more information on the program, visit their homepage.